Currents in the ocean and fjords spread viruses that are killing large numbers of farmed salmon. Where should fish farms be built? And should they all be in use at the same time? Researchers now know more about how to limit the virus problem. Pancreas disease is a viral infection in farmed salmon that causes major economic losses because it reduces how much the fish grow and increases mortality. 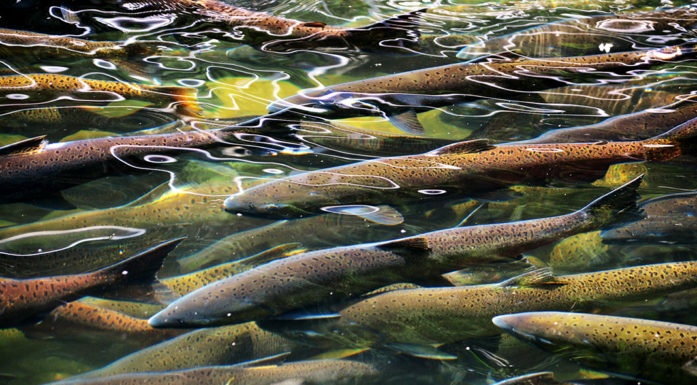 When farmed salmon are weakened, they also become more susceptible to other diseases. Pancreas disease (PD) can resolve on its own, but often mortality is high. Researchers monitored the ocean currents in the Romsdalsfjord and in Nord- Trøndelag county in 2014. Data from the observations have been transferred to a digital model, where researchers then depicted virtual virus particles in order to understand how the disease can spread from one fish farm to another. In addition to threatening fish welfare, every year the disease leads to major losses for Norwegian salmon breeders. A single outbreak can quickly cost a small aquaculture operation NOK 10 million. Ocean currents are one of the most important pathways for the disease, carrying the virus from one fish farm to the next. Planning for where best to locate aquaculture facilities, and knowledge of which facilities to use when combatting the disease, can prevent the spread of the disease, new research from NTNU in Ålesund shows. Researchers in the project “Strategies for limiting the spread of PD” monitored ocean currents in the Romsdalsfjord and Nord-Trøndelag in 2014. Data from the observations were transferred to a digital model, where researchers created virtual virus particles. The technology has made it possible to monitor how the disease can spread from one aquaculture facility to another. “The virus can survive for a long time in Norwegian coastal waters. But since it does have a limited lifespan, we’ve also removed the virtual virus in the data model after a while to simulate natural conditions,” says Lars Gansel, an associate professor at NTNU in Ålesund. The researchers have also tested the real virus in the lab. This allowed them to figure out how much of the virus is needed to infect a salmon. The models show which fish farms are most susceptible to becoming infected and which are the most likely to transmit the disease to neighbouring facilities. Researchers can also use the models to predict how the virus moves when the current changes and how the currents are affected by temperature and the seasons. The researchers released the virus – virtually – into four water pathway models and compared them to better understand the spread of pancreas disease. The red arrows show how the ocean currents carry the virus from one farm to the next. Using a map like this, the aquaculture industry can see which areas are most vulnerable when there is an outbreak. “This method allows us to calculate how much of the virus is transmitted to other fish farms. If the result is the same every time, then we know that the calculations are correct. By monitoring the ocean this way over a year’s time, we can detect probable fluctuations in ocean currents and do a better job predicting how viruses are spreading,” said Gansel. Norwegian authorities have divided the Norwegian coast into production zones for farmed salmon. Large designated coastal areas without fish farms act as “firebreaks” to prevent the spread of infection. “In general, we need more information on where production areas should be located along the entire coast of Norway, what makes for good firebreaks and how we can use them better,” says Gansel. Some of the research indicates that actual firebreaks, such as Buholmsråsa in Sør-Trøndelag, do work. “Previously, firebreaks followed county boundaries, but luckily they’ve recently been changed to follow natural boundaries,” Gansel says. An example of a natural boundary would be where the coastline directs the northbound coastal current out to the ocean, which lengthens the distance a virus has to travel from one fish farm to the next. And large islands or areas with slow water movement can prevent the virus from reaching a fish farm during the virus’s lifespan. The research project will also look at the economic consequences of regulating the use of fish farms during disease outbreaks. “If the ocean currents flow in a direction that results in one fish farm spreading the virus to others, one possibility may be to kill the fish. Farmers could also stop using multiple fish farms at the same time to create small firebreaks in a production area. This is where research can offer solutions for what measures are beneficial and what can be profitable in the long term,” says Gansel. The breeders are required to kill all the fish in the net cages in the case of a viral outbreak if they happen to be in an area where PD is being combatted. “In areas with both big and small fish farms, breeders may disagree on when the fish should be slaughtered and which facilities need to slaughter their fish. The breeders prefer to keep the fish until they’re bigger to mitigate their financial loss. Improving our understanding of how currents spread the virus makes it easier to see where the salmon should be slaughtered first to keep the virus from spreading to the other fish,” said Gansel. The researchers will also assess the economic impact of disease prevention measures and rank the overall costs after figuring out loss and gain in the short and long term. Authorities have proposed new zone boundaries along the whole coastline of Norway. The first version of the proposal from the Ministry of Trade, Industry and Fisheries has been made available for public comment. A monthly virus screening of farmed salmon is also being proposed. The research project’s management group has received feedback that the PD research results are being taken into account in the planning. “Our results have transfer value to all the areas with fish farms in Norway. So we hope that the research will be used in determining future zones to prevent the spread of disease in farmed salmon,” said Gansel.